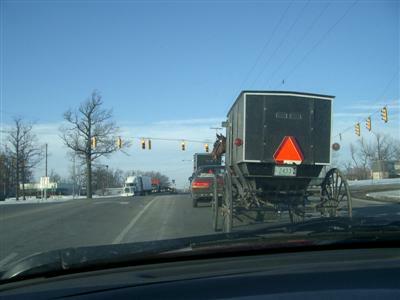 Here’s a common view from behind the wheel here in Hoosierville. You know those often-cheesy return address stickers that are always showing up in the mail? Various outfits use them for fundraisers and such, and send them unsolicited. That’s the key word, unsolicited. So, do you feel guilty for using them without sending a contribution in return? Some people do. Do I? I’m not a big fan of getting spammed, and I consider it physical spam. I hate addressing envelopes, and I send them as little as possible. So these stickers help cut down on the addressing I have to do on the few I do send. Went and saw a really young southern gospel group awhile ago, Crystal River. They were ok, but I couldn’t quit grinning at them. They sounded so different from the way they looked, it was almost funny! I couldn’t get over it. They looked, well, I don’t know, like the picture on their website linked to above. Preppy punk hipsters or something. But they sounded 100% southern gospel! The visual/auditory contrast was more than I could get over. A blind person with my grasp of the genre would’ve guaranteed you that they were in suits and ties and polished shoes, but nay! For quite awhile now I’ve been using Mozilla Thunderbird for my email client. I pretty much like it, but lately I had been having some problems with it. Most notably with backing up and restoring my accounts. I use MozBackup for that task, and at first it worked really well (MozBackup also will backup all your Firefox settings). Then in more recent times I began having trouble with restoring a backup, it wouldn’t put all the data back in the accounts properly. I especially was dismayed by my main Inbox folder remaining completely empty after a restoration. Another issue that puzzled me was no matter how much stuff I deleted out of my email folders, the backups kept getting bigger and bigger. I think they were getting to be around 300MB, and I knew I didn’t have NEAR that much stuff in there. I did a little research, and came across a tidbit that I wasn’t aware of. If you don’t manually compact folders in Thunderbird, it can lead to big problems. And among those problems are empty inboxes, erratic behavior, and large profiles. Like many email clients, Thunderbird just marks a message and then hides it from view when you delete it. It’s only when you compact folders that the deleted messages are physically deleted. So even though I was deleting messages, they were still actually there, just hidden. This was creating such a mess that it was starting to affect function. It wasn’t until I compacted folders that the deleted messages were actually gone and the mess was cleaned up. Everything seems to be working very well right now. File – Compact Folders will do the trick, as will right-clicking on a folder and selecting the Compact This Folder option. Awhile ago events occurred to make me realize the immediate need for much more storage. I run a recording studio out of the Iced Tea Forever.com office, and I was running a bit short on gigabytes. My main computer had roughly 200GB split between two EIDE hard drives (at that time), but that was just enough to get me by for that machine. I needed a bunch of digital real estate where I could park some serious data. The motherboard on my primary work station has the capability to add a few more SATA hard drives, but that’s a little over budget right now. Enter my buddy Hans and his Used Computer Parts Repository! (Motto: We Ship Fast, but Not Next Day.) 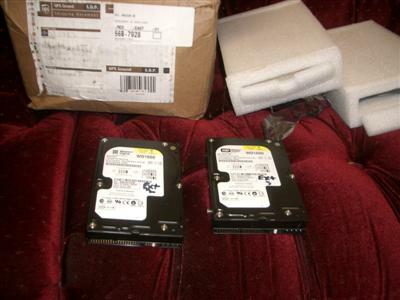 He agreed to unload a couple of EIDE 160GB hard drives on me for a nominal fee. What a great solution! This allows me to make use of my old computer for very little additional money and leaves me considerable space in my new one for upgrading further in the future. 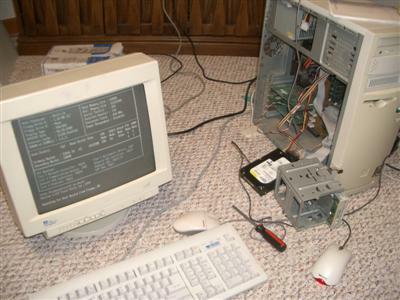 The plan was to stuff the twin 160GB’s into my old computer tower and throw it on the network. 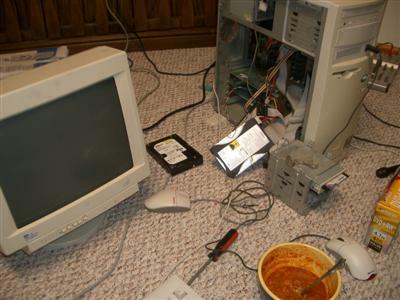 Then I could just dump stuff I want to backup and archive onto the old machine sitting out of the way in the back room. The two drives were formatted as NTFS, and I needed to use Win98 on this machine. I researched on the internet and figured out how I could convert NTFS to FAT32. Oh boy. Looked like I needed to completely wipe the drives and reformat. Ok, no problem, I did that and tried installing Win98. I didn’t get far. While running the Scan Disk at the beginning of the installation, it would hang at the “Media Descriptor” part of the scan for one of the partitions. I eventually went back and used FDISK to delete the offending partition. One of the limits of FAT32 is that it can handle partitions no larger than 32GB. You can only have 4 Primary partitions, and 4 x 32 is only 128GB out of the 160GB drive. Trying to circumvent this, I created 3 primary partitions and then made an extended partition out of the remaining space. In order to convert it to FAT32, I had to further divide the extended partition into 2 logical partitions. It was one of these logical partitions that was causing all the Scan Disk problems. What a confusing mess. That’s what I get with using such an archaic beast as Win98. But, in the end I got it all worked out. Since my new motherboard has wireless onboard, I left the wireless card in the old machine. I threw it in a corner in the storage room and plugged it in. No mouse, no monitor, no keyboard, nothing but the tower and power cord. Once booted up, I use TightVNC to control it from my main desktop. I back up all my files to it over the wireless network, it’s slicker than slick. I’m very happy with how it turned out. Since we’ve relocated the ITF office, I now have it set up in the back room with a monitor and user input devices. I still primarily access it through the network, but if I need to do any troubleshooting it’s nice to be able to have immediate access to it. Went to visit By and Amy this weekend. We drove a total of 1,127 miles, much of it in pouring rain and limited visibility. We spent $32.95 on tolls (legalized robbery), and $93.73 on gas (more of the same). Driving our ’98 Chevy Monte Carlo (overrated GM product), we got 26.38 miles per gallon. That’s not too bad, I figure. I got him back later. Here’s a collection of things I want to accomplish in my lifetime. Strikethrough indicates completion. Become an official endorser of Campbell’s Chunky Soup. Become an unofficial endorser of Raspberry Cow Tracks Ice Cream. Get a book deal based on material from ITF. Sing the National Anthem at a Super Bowl. Sing the National Anthem before a youth group basketbrawl game. Sing in a quartet at the White House. Sing in a quartet at the Nursing Home. Sing on a Veggie Tales show. Sing for chapel at the local Christian school. It’s no secret that I’m an a cappella freak. A cappella rules, and I’m a life-long die hard. That being said, I will occasionally bend and flex my rules and preferences and tolerate some instrumentation. Rarely an instrumental project though! Not long ago I purchased one of the VERY FEW instrumental recordings that I own. Very few. But this one’s pretty good, and I’ll tell you what I like about it. These guys (just kids, they are) are great musicians, and not only are they good players but they can take a piece and make music out of it. What I really like, though, is their creativity and the way they take a song and make it theirs. Listen to track 4, “Nothing but the Blood.” (1.3 MB) Great stuff. The band is primarily made up of guitar, mandolin, and bass. One of the things I dislike about a lot of instrumentation is that it seems like someone was trying to set a record for how many different instruments they could get on one song. A noisy mish-mash of clutter is usually the result, but that doesn’t happen here. I asked Kyle how they got the name “Apogee.” He replied that it came from a “Word of the Day” mobile phone vocabulary enhancing program. They started joking about it, and over time the name stuck! ” Wise decision, I’m sure that wouldn’t have done anything for them! Yes, I am special, I have an autographed copy. 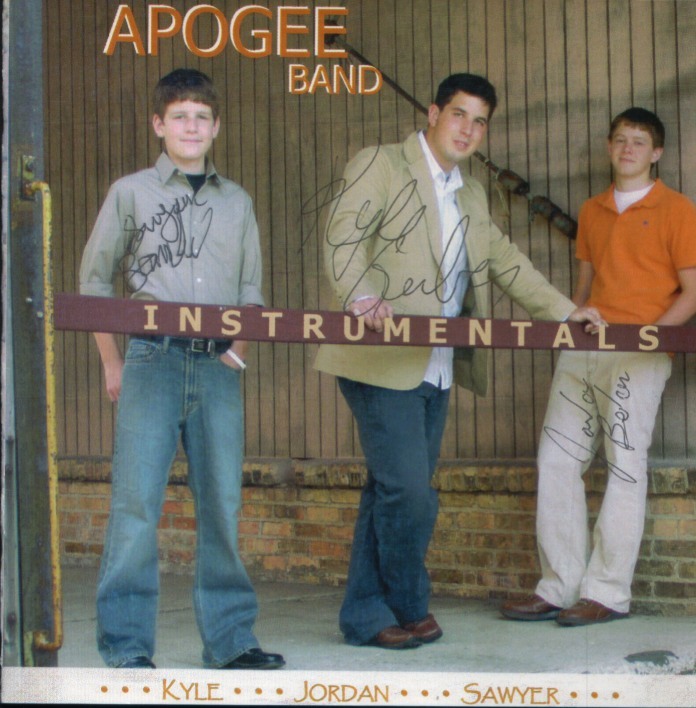 Here are some pics from the studio of the Apogee Band recording this project. Update: I knew there was something I was forgetting! Contact Gospel Echoes if you’d like a copy. I’ve been having a lot of computer problems recently. The last 6-8 months I’ve experienced strange and severe massive crashing with not much warning at all. Then intermittent boot problems began. My comp was getting slower and slower when it would boot, too. Quite often it would refuse to boot at all, saying something like “XP absolutely refuses to boot because the following file is missing or corrupted: Windows\system32\config\system.” Which is a registry file. I’d mess around and try a bunch of things, or just try rebooting and rebooting and eventually I’d drag it kicking and screaming back to life. Nothing I tried would work. I tried a bazillion reboots (worked sometimes before), dove deep in the Recovery Console swapping out registry files, even tried Fred’s great idea on a complete non-destructive XP reinstall. No such luck. I finally gave up and typed that magic problem-solving line, “format C:\” and sat back to wait. Yep, I wiped ‘er clean and started afresh. I had everything backed up so I don’t think I lost anything. I started putting things back together then and determined to find the underlying problem that caused the whole mess. My theory is that all those massive crashes over the last number of months gradually trashed the registry and/or some other rather important files. I thought that the crashing problem was related to my sound card somehow, as the crashes were usually right after some audio-related action. I gradually reinstalled drivers and enabled devices, until sure enough, Windows Media Player started choking and a fresh install of XP fell flat on its face. Then I realized that in addition to my monster studio sound card, I had another more basic sound card activated, and maybe the problem was in a vicious feud between them. I should have figured that out a long time ago. At least I’ve got it figured out now, I hope. I disabled the second sound device, and so far preliminary tests have come back very positive. Anyway, that’s pretty much all I’ve been doing the last half of this week.